A blog about beer pancakes. I feel like Abita is one of those breweries I have a love-hate relationship with. I’ve never been particularly fond of their flagships (though that might be the curling club’s fault, considering we had it on tap constantly for the first year or two), but it seems that their specialty brews can be interesting, at least. 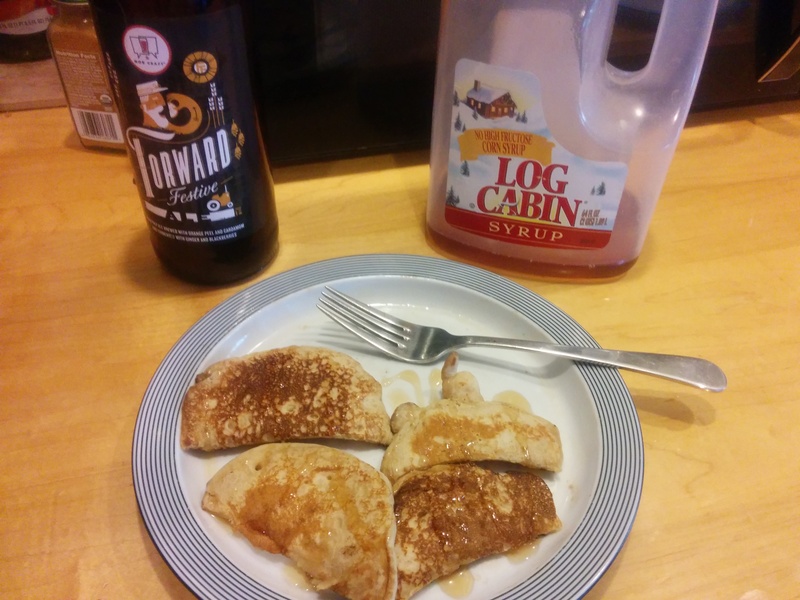 So, of course, I bought some and put them in the beer cellar, and nearly a year later thought I should finally get around to making some pancakes. Abita’s Maple Pecan is a bourbon-barrel aged nut brown ale, which if that sounds like a mouthful it’s because it is (pun intended?). There’s a definite boozy aroma once you crack the bottle (in fact I used the term “boozy” to describe elements of the flavor 3 times in my notes), but it’s complemented by subtle maple notes. The beer pours a fairly light brown (lighter than I expected, at least) and had virtually no head (not sure if this is the beer’s fault or it being a year old). You can certainly tell it’s been barrel-aged but there’s a very slight hint of pecan, if at all at first taste. 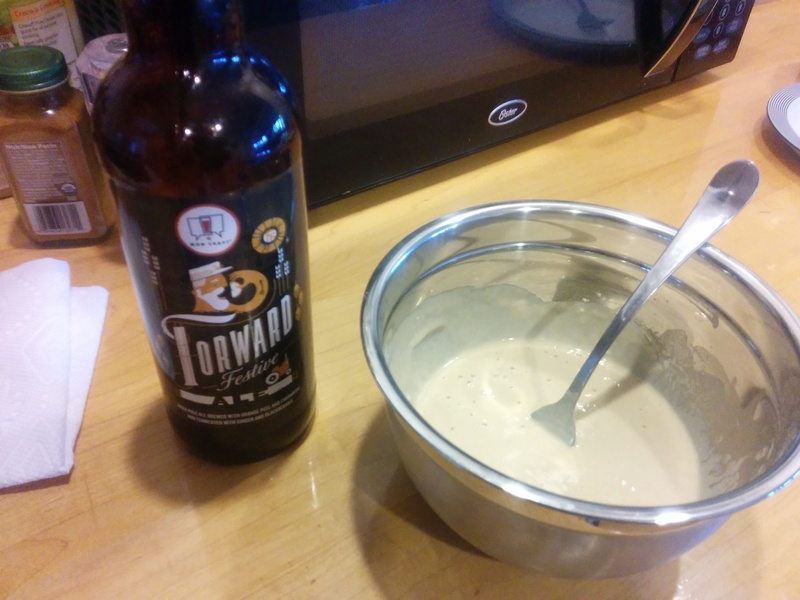 The batter seemed to cover up all of the overwhelming barrel characteristics the beer had in liquid form. It also helped to bring out the malt and nut flavors I was missing in the beer. 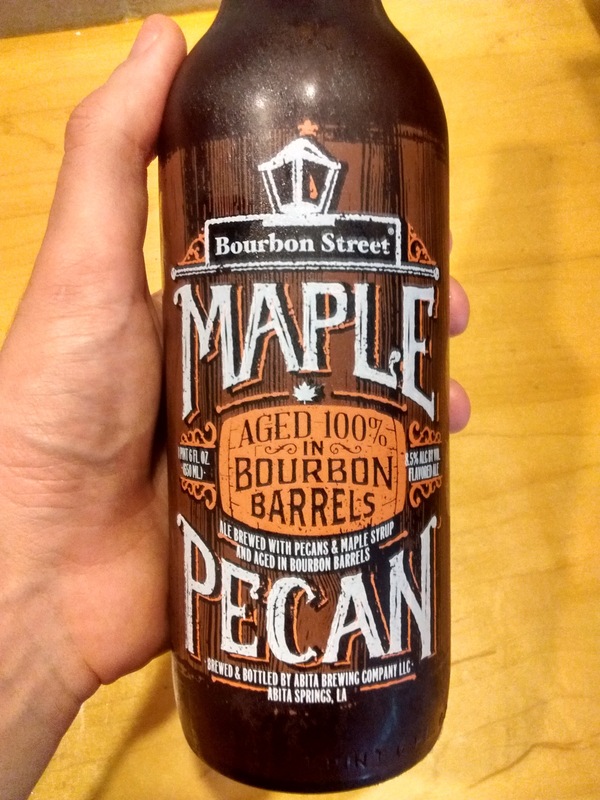 Overall, there was a sweetness to it, but not necessarily maple notes. The consistency didn’t seem to draw much attention, either. 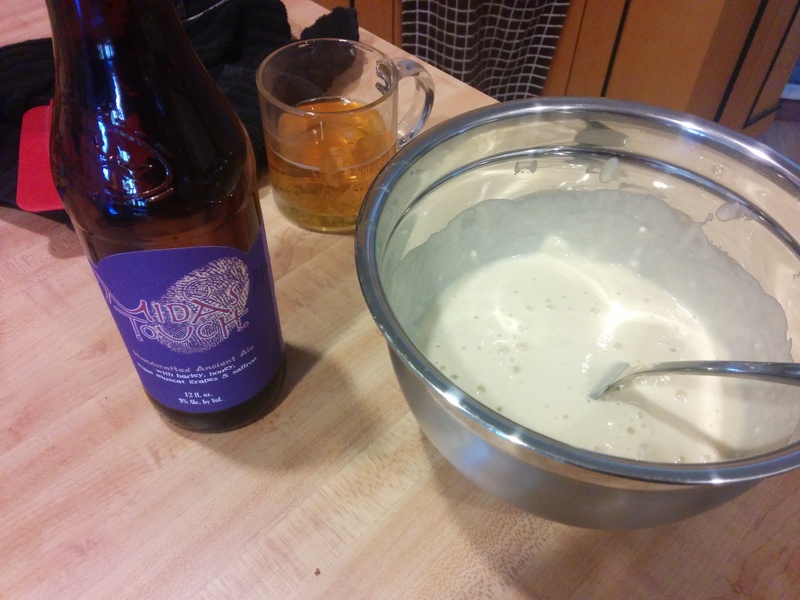 So far the beer and the batter have been underwhelming, but we’ll see what that means for the pancakes. I think throughout the process I was hoping for more maple and it just never delivered. The booziness was completely gone (typical), but so was the maple. In fact, so was the pecan. 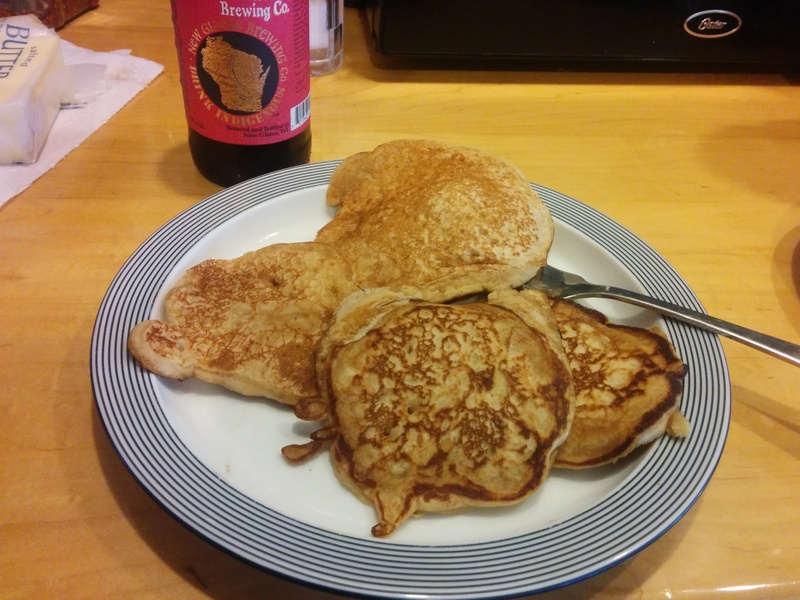 These pancakes basically tasted nothing like the beer or batter. They did have this delightful wheatiness to them, though. Almost like buckwheat, but more subtle. Pancakes: Yes. Even though it didn’t come out tasting much like the beer, the pancakes were “actually really nice”. Syrup: No. 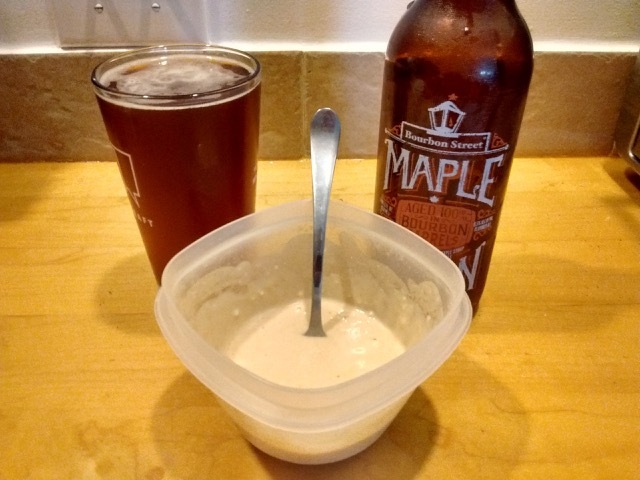 You’d think with a supposed maple beer, adding syrup would help those flavors, but I didn’t notice anything. If anything, it enhanced the pecan notes, but not enough to justify syrup. A little close on these last two photos, eh? If you liked this post, share the love! 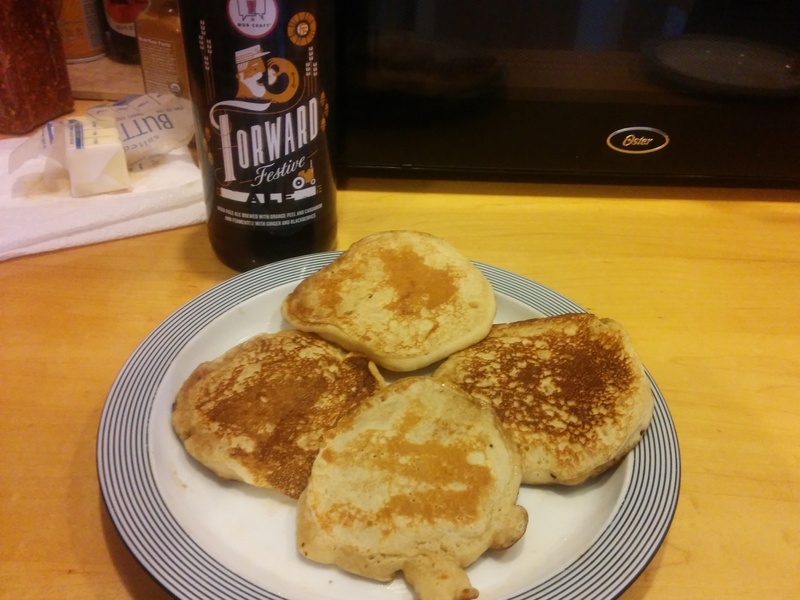 Have you ever bought a beer while travelling only to come home and put it away and then completely forget you had it/meant to make beer pancakes out of it? I know, that last part happens to everyone I’m sure. Stone Arch (Cellar? Their branding/website is confusing) is a brewpub in Appleton, WI. I got this beer last September when I was playing Sectionals in Appleton. When in Rome, right? But then it sat around in the cellar (no pun intended) for 9 months. A mere mortal may’ve given up on it, but not I. The first thing I noticed when opening/pouring this beer is how crazy carbed it was. Now, to be fair, a lot of breweries (especially small/local establishments) don’t plan their beers to sit in the bottle for months on end, so I’m not going to fault them for it. Aside from that, the beer has a wonderfully dark, smooth flavor to it with mellow vanilla notes. 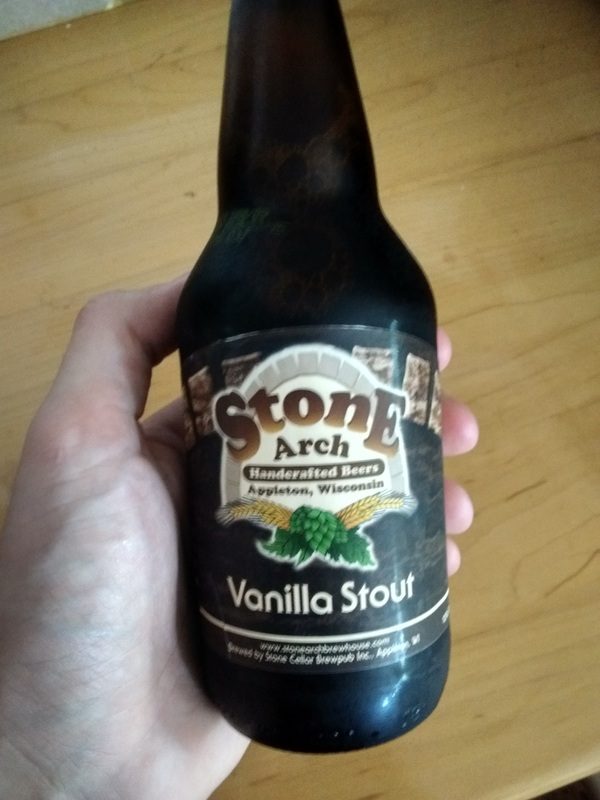 If my memory serves me right, the vanilla is more pronounced before the beer ages, so be on the lookout for that. The interesting thing about this batter is that it actually came out way flatter than I expected. I still have no idea what accounts for flatness of batter, considering some beers have almost no head in beer form but are really bubbly as batter. There were mild vanilla notes in batter form as well but overall there was a sweet, almost cake-like flavor. 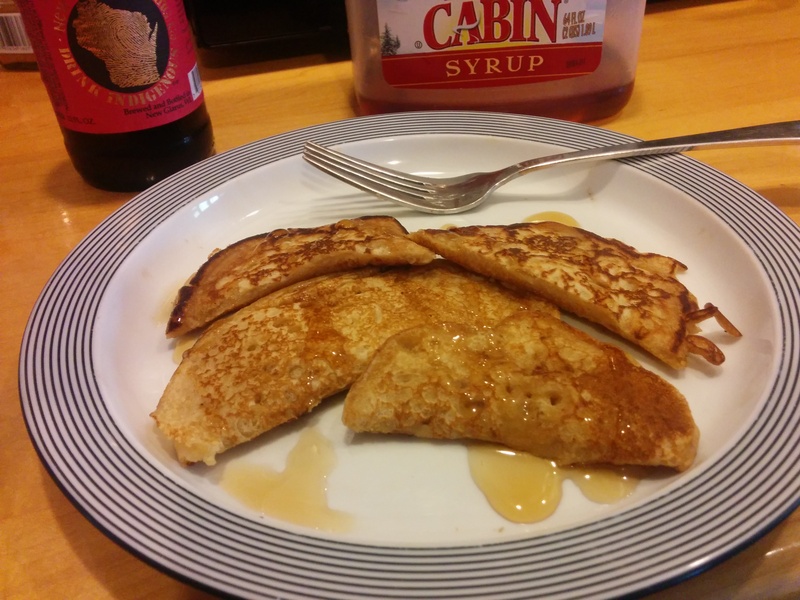 Surprisingly good, and set up pretty high expectations for the pancakes. Obviously this isn’t my first time making oddly colored pancakes, but for how dark and roasty the beer is, I was kind of surprised at how light the pancakes turned out. In terms of flavor, they were a huge letdown. They basically just tasted like pancakes. No vanilla, no malt. There was a subtle dryness/bitterness to them, almost like baker’s chocolate, but otherwise there wasn’t much to be had here. Pancakes: No. 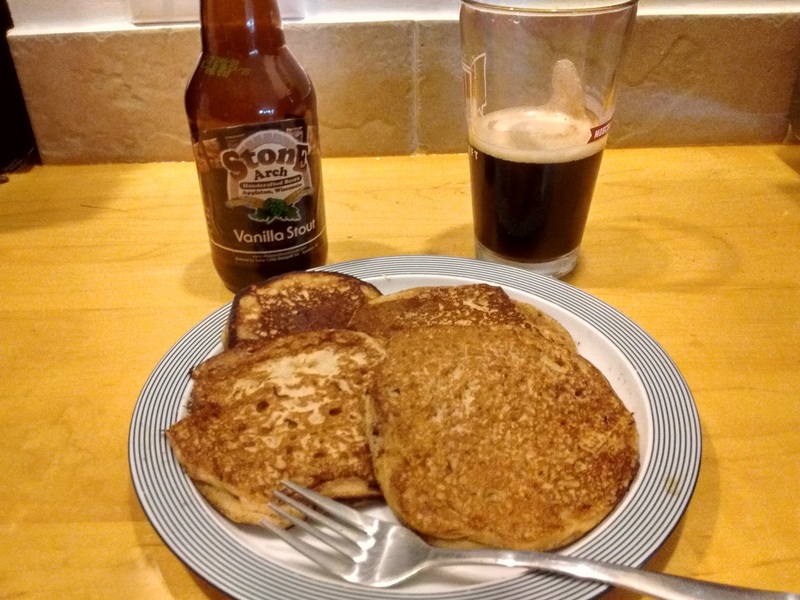 The beer is actually pretty enjoyable, especially if you don’t let it age for 9 months, but in pancake form there’s no point. Syrup: No. Adding sugar to the mix can sometimes bring out flavors that were missing without. Here it just added a sugary sweetness. While this week’s entry isn’t our only Mobcraft entry, it might be one of the most unique we’ve done so far. Every year, Madison has a week-long event filled with conferences, meetups, talks, and open houses, all centered around entrepreneurship. It’s called Forward Fest. Every year since 2013, MobCraft has brewed a beer selected by the community to be that year’s “Festive-Ale”. They bottle a select few of them for festival attendees to garner one way or another. 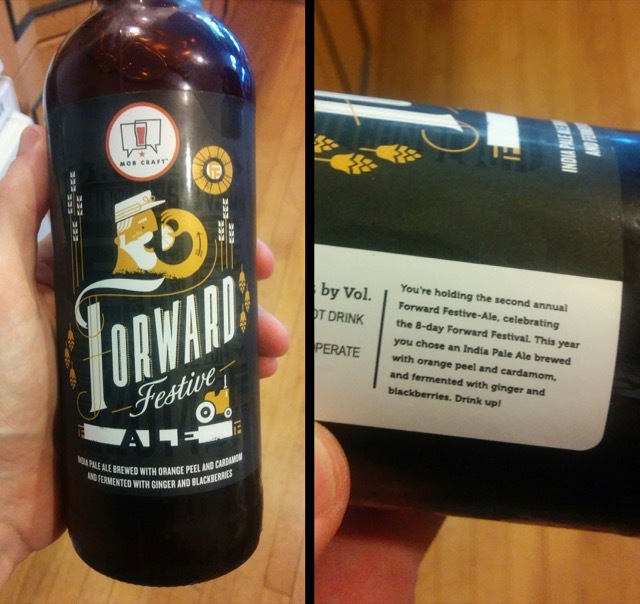 The 2014 Forward Festive-ale was an orange-peel-cardamom-ginger-blackberry IPA (say that five times fast). This particular bottle is almost 2 years old, and based on my memory of the beer, it had a substantial impact on the beer. It poured super foamy (which made measurement interesting) but was a cloudy, dark amber in color. The initial hoppiness had mellowed, and the cardamom and ginger really started to show through after aging. What was originally a good beer turned out rather delightful. 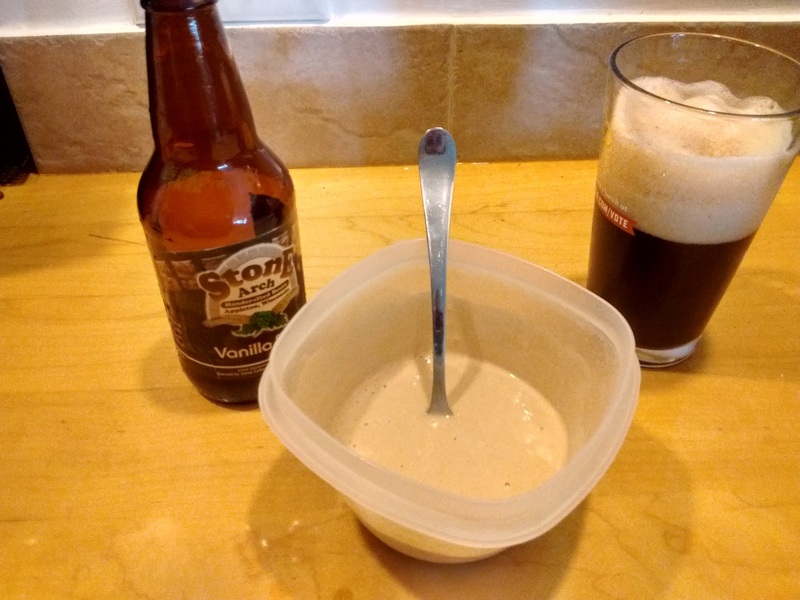 As mentioned, measuring out the right amount of beer for the batter was a little difficult given how foamy it was, so I erred on the side of having too much liquid. That being said, (possibly due to the headiness) the batter came out much thicker than average, and the ginger aroma and flavor was apparent. So far in the process I had picked up almost none of the orange peel, but the batter started to get orange-ier with more tastes. The pancakes had an interesting aroma - somewhat spicy, but I couldn’t quite place it. Maybe the ginger, maybe the cardamom, maybe a combination. The blackberries hadn’t made an appearance thus far and that didn’t change at all. 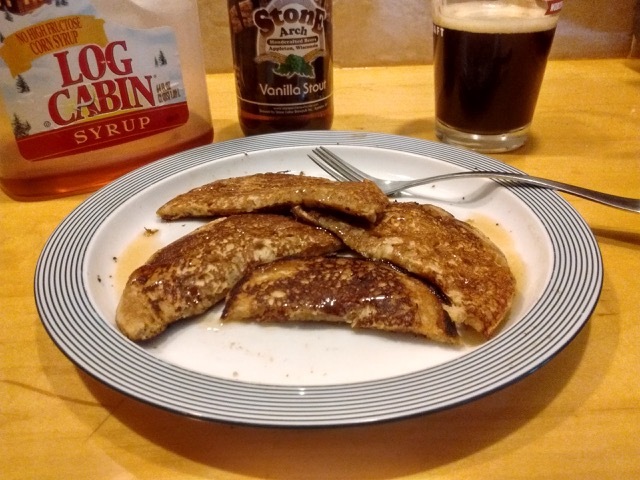 The pancakes had a sweet, almost wheaty taste to them, and the ginger was definitely there. This is one of those instances where I’m going to break format. There likely are very few (if any) of these bottles still in existence, so to give recommendations seems silly. The one interesting part I will comment on is adding syrup: Adding syrup gave these pancakes some added sweetness that reminds me of ginger medallions - sweet, sugary, gingery goodness. Dogfish Head is one of those breweries that I probably don’t give enough credit to. This is probably due to how popular they are, but also might be because they’re known for their IPAs, which I’m known for not liking. 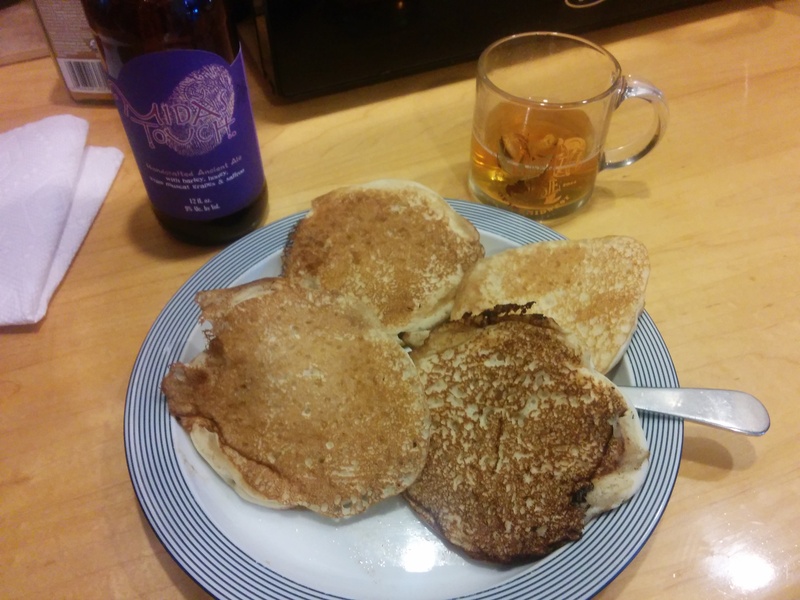 Midas Touch is one of those beers that defies convention, though, so in true BBB fashion, I knew I had to make pancakes of it. When I say “defies convention”, I’m not kidding. 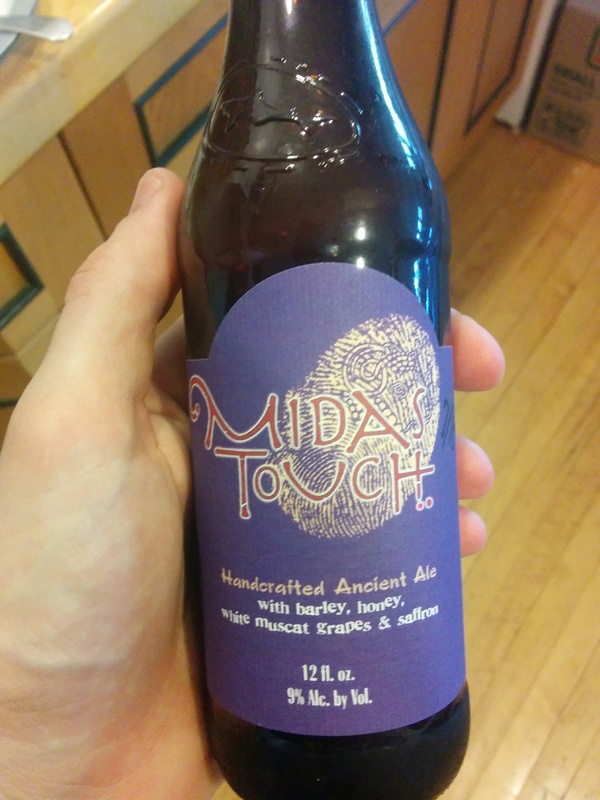 Midas Touch is, as its marketed by Dogfish Head, an “Ancient Ale”. As the story goes, residue found on 2700 year old vessels from the tomb of King Midas was analyzed, and these were the ingredients they found: barley, honey, saffron, and papaya/melon. From this, they tried to recreate the same composition in beer form, giving us Midas Touch. It pours a light blonde with virtually no head, and my particular bottle was approximately a year old (so a fresh one might look/taste/behave differently). The sweetness of the honey and the barley flavor profile come through first, and there’s a subtlety to the finish that took me awhile to place: it’s almost like a champagne or mead on the tail end. 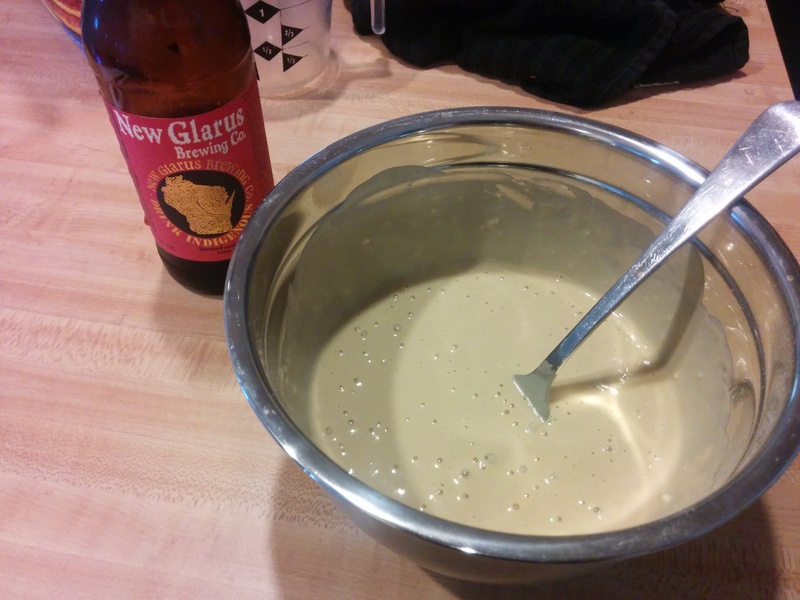 What is a really interesting and complex flavor profile in the beer all but vanishes in batter. This isn’t all that rare, unfortunately - delicate flavors usually just don’t stand up to batter. Midas is no different. It had a thin, light consistency, which almost lead me to add more mix, but in the end I decided against it. The batter did have a slight dry grape finish to it like the beer did, but without the other flavors in support/contrast, it wasn’t very enjoyable. 2700 years in the making, the first thing I noticed was a slight honey aroma, like in a mead. It didn’t smell like honey, but as a mead drinker, I recognized it almost immediately. The sweetness and mild herby flavors from the saffron and barley were completely nonexistant, yet that dry grape, champagne/white wine-esque finish was still there. Overall, I was pretty disappointed. Pancakes: No. Midas Touch isn’t the rarest beer out there, but considering it’s interesting and delightful in liquid form, making pancakes out of this would be a disservice to the beer. Syrup: Yes. 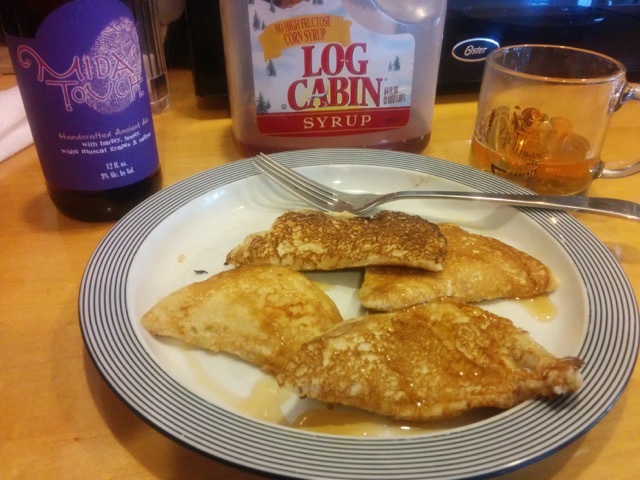 That being said, adding syrup certainly improved things. The flavors were all richer overall, and adding syrup brought back a strong honey flavor (whaddayaknow). Still not great, but certainly better. I always get really excited about verticals on this blog, and we’ve already had a few (just search “vertical” in the sidebar), but I’m always happy to introduce another. 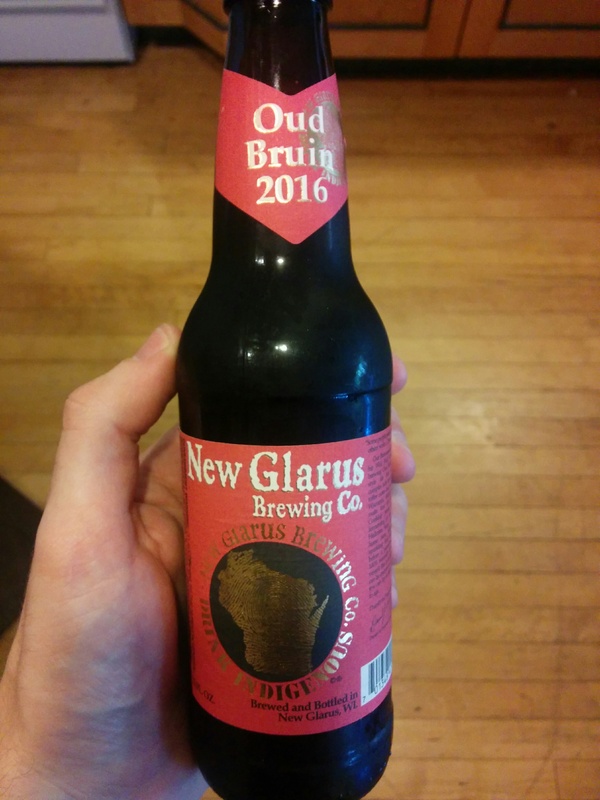 New Glarus’s annual sour (though it’s no Enigma) has made one prior appearance on this blog and I was happy to be able to bring it back again this year. Let’s see how it fares! Oud Bruin is one of New Glarus Brewing Company’s “thumbprint” series - brews that aren’t exactly seasonal, aren’t exact rotational, but are all pretty incredible. Oud Bruin is more of a traditional Flanders Red style that features a delightfully balanced tart sour with cherry notes. The fruit flavors don’t overwhelm a strong red/brown ale style body. Really a great beer overall. The batter was surprisingly thick given how easily-drinkable the beer is, and it has a pleasant light brown color. At first, the batter tasted nothing like the beer, but had an oddly biscuity flavor. After a few tastes, I was able to adapt, and it developed a lightly fruity finish. Not sour at all, but overall really nice. My first impression of these pancakes was a wonderful cherry aroma. It was subtle (like all of the fruit flavors have been throughout), but I immediately picked up on it. 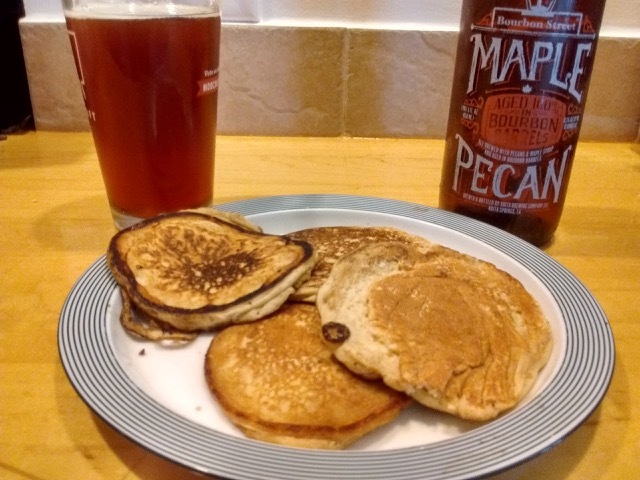 Flavor-wise, again, at first there wasn’t a very strong Oud Bruin-esque flavor, but after a few bites my taste buds adapted and the pancakes developed a wonderful cherry finish to go with a nice malty backbone. Still not sour, but they left a crisp, fresh feeling. Pancakes: Yes. 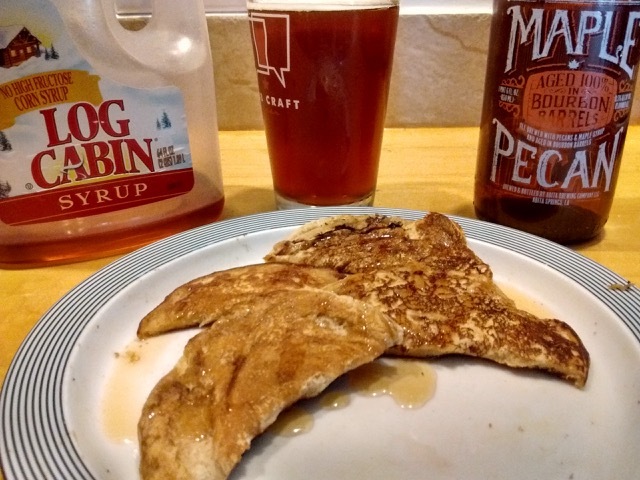 I’m remiss to say make pancakes out of this beer because how good the beer is, but that’s not fair to hold it against the pancakes. They were subtle throughout but a really pleasant experience.